Wow - what a fantastic class the Pufflings are! Trying new things, playing and tidying away. 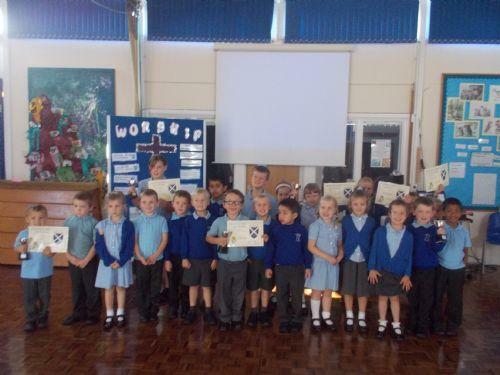 a brilliant beginning to your time at St. Andrew's. Well done all of you! Chipmunk class have been buzzing with ideas since they came back from their summer holidays. Mrs Argent was bowled over by their amazing literacy work, Rainbow red words, alliteration, super sentences .... wow! Penquins: Harry Webb - Don't give up! Wow Harry! You have impressed Miss price by sticking at tasks! What a perfect penquin! Sophie has strived for accuracy and precision this week and has worked hard to be the best she can be! Well done Sophie! Jessica has been extremely helpful to others in the class - what a star! Owls: Charlotte Caswell - Don't give up! Charlotte has had an amazing first week in Yr. 5, showing determination to succeed, enjoying new challenges and putting in the hours at home! What great learning! Freia has shown great determination, courage and skill to achieve 2nd place in the British BMX Championships. Many congratulations Freia!